Byte conversion allows for quick conversion between digital information units. 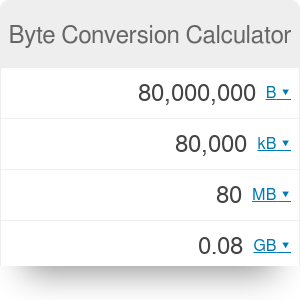 Byte conversion is a simple tool that helps you quickly convert between units of digital information. Calculator coverts over 20 units, starting with very common megabytes or bites and including also rare units such as exbibytes or tebibits. Byte conversion is often used in estimating the video file size - make sure to check it out! The most basic unit of digital data measurement is bit, 8 of which equal a byte. Byte-based values are commonly used when describing the capacity of drives, storage spaces or size of files. Data unit conversion is very simple when using bytes as you simply add/remove specific number of zeros to get the correct value. While byte is very tiny, kilobyte equals 1000 bytes and megabyte (1MB) is the same as 1,000,000 bytes (and 8,000,000 bits). Gigabyte (1GB) equals further 1,000 MBs while 1TB is 1,000GB. Check out our bandwidth calculator to find out how much time will it take to download a file or how fast the connection is. Byte Conversion Calculator can be embedded on your website to enrich the content you wrote and make it easier for your visitors to understand your message.